Steelite International are delighted to introduce a new Scoop bowl in melamine material. Based on the Taste Scoop bowl in our Performance body, this popular shape has been adapted to allow us to offer larger sizes of bowl in either black or white. 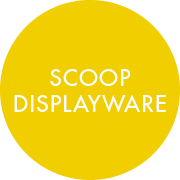 They are perfect displayware solutions. These bowls can be used in conjunction with the rubber pedestals to elevate presentations and create something that little bit different.